11 April 2019 New Landscape & Industrial National Sales Manager. 10 April 2019 Quality is Everything says Simon Taylor. A high volume streamline operation, Clockhouse Nursery produces over 1 million quality plants - sold through its busy plant focused retail centre. Offering customers a huge choice of varieties, at a competitive price, it attracts a loyal customer base. 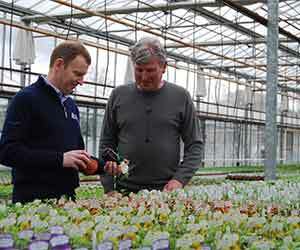 Situated at Forty Hill, just inside the M25 near Enfield in North London, the 13-acre nursery has a turnover of £3million and produces 80% of its own plants on site - 80-85,000 pack bedding, 800,000 patio and pot bedding, 80,000 shrubs and 40,000 perennials in 2litre and above. With a reputation locally for offering an unbeatable selection of plants, the nursery grows 53 different varieties of Calibrachoa while for highly specialist shrub species production can be less than 100 units. Founded in 1928, the nursery is run by the founder’s grandson David Mills. Alongside a continuous and ambitious renovation programme, David is a genuine innovator constantly on the look out for time and labour saving new products and technology. If nothing is on hand he simply designs it himself – which recently includes a pair of impressive new single span Polybuild roll up polytunnels, with Solar Woven sides, overhead misting irrigation and inflated roofs. To simplify the production and retail operations, the vast majority of plants are potted directly in to different coloured pots according to the retail sales price. Levington has been the growing media of choice at Clockhouse for over 30 years. “While originally we self mixed, we’ve switched to Levington Advance Solutions mixes,” says David. “We currently rely on at least eight different bespoke growing media mixes - all containing different Osmocote controlled release fertilizers and plant protection products, including Exemptor, tailored to different areas of our production. “The more we can incorporate in to the growing media the easier it makes it for our busy production team. For precision nutrition we rely on Osmocote Hi.End or Osmocote Exact Standard with differing longevities – either 8-9 month or 12-14 month. We use Osmocote Bloom (2-3 month) in all our bedding production and incorporate H2Gro granules in our basket mixes to help with water conservation. Some lines, such as Cyclamen, Primulas and Pansies, may require some supplementary water soluble feeds – we use Peters Professional for greening up and to boost flowering.